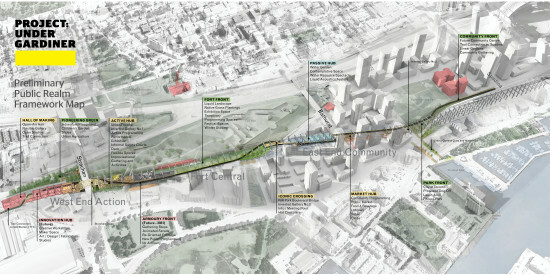 Toronto's ambitious plan for a linear garden under the Gardiner Expressway is made of 55 "outdoor rooms" - Archpaper.com Toronto's ambitious plan for a linear garden under the Gardiner Expressway is made of 55 "outdoor rooms"
Toronto’s waterfront is separated from the city by the elevated Gardiner Expressway. While access underneath is relatively easy, it isn’t a pleasant transition. 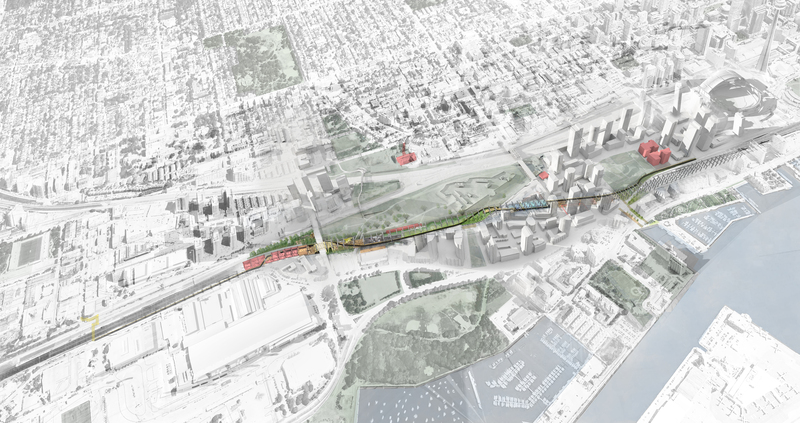 Torontonians, however, can expect some changes to their waterfront corridor as 10-acres of new public space and a mile of multi-use trail are being built under the highway. 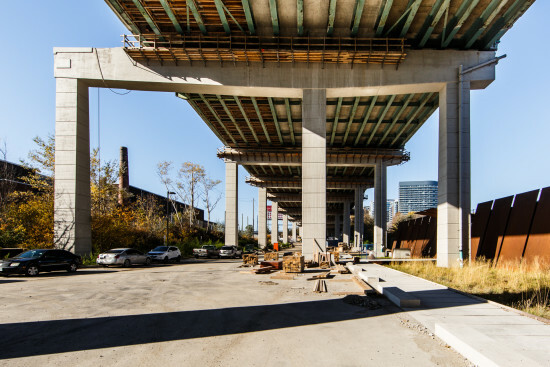 Project: Under Gardiner was designed by city planner and urban designer Ken Greenberg with Marc Ryan and Adam Nicklin of PUBLIC WORK, an urban design and landscape architecture studio in Toronto. The new park is slated to open in 2017. The scheme is strategically placed along a portion of the expressway that connects numerous destinations—including the CN Tower, Ripley’s Aquarium, Fort York (an historic military site and museum), BMO fields, and the CNE fairgrounds—as well as a string of high-rise neighborhoods. The project is conceived as a series of 55 “outdoor rooms” formed by the structural bays of the Gardiner. While it is a continuous park, each section or “room” will have a distinct atmosphere and will lend itself to particular activities and programs, including gardens, art fairs, playgrounds, and public markets. In addition to multi-use park space, the project boasts a 1,640 foot connection to a prominent GO train station, a bridge for pedestrians and cyclists over Fort York Boulevard, and an urban theater at Strachan Avenue to accommodate public programming and year-round performances.